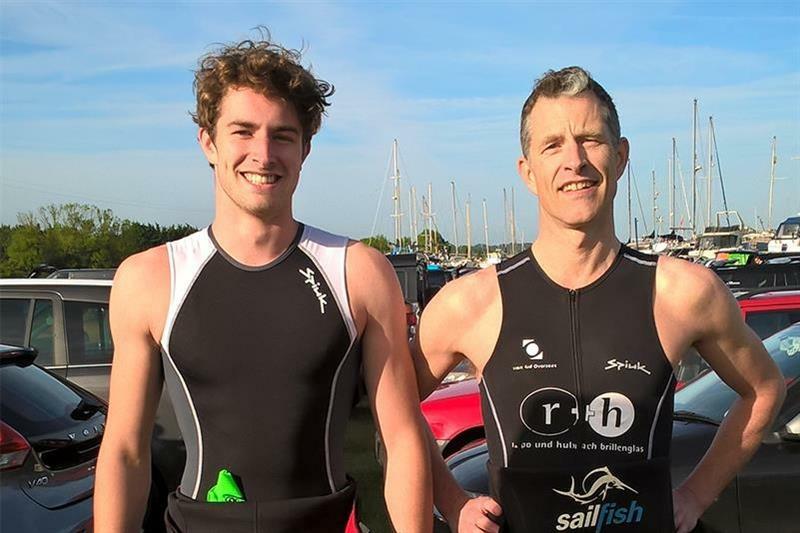 Forgive yet another race report but It’s been a busy early season of Optical sport and fundraising for optical charities and people keep asking. With the weekend of May 13/14 and the CooperVision London Revolution challenge for Optometry Giving Sight barely forgotten in my legs a new event loomed. Fundraising for the CooperVision project us still underway but The Big East Triathlon was on my radar. The Big East is organised by Dengie Events over in Essex and it also organised the Fambridge Half Iron Tri which I have raced for Blind Veterans UKfor the last two years. Last year I had a big of a ‘mare with the Fambridge event. As I was wearing the Blind Veterans Kit I switched back to the Vision Aid Overseas kit for this race in the hope it would bring me good luck. As well as being keen to put that experience to rest with a positive triathlon I also had a son back from university, and keen to show the old man how to race, we signed up for the Big East. The fundraising was low key as I only raced the London Revolution the week before. A couple of donors were clearly keen to see ' how it would go'. It was also a great opportunity to try out some optical products. The sun was already struggling through the mist at four o’clock in the morning as we made our way from Surrey to Essex. It was a little early for contact lenses but having parked up in Bradwell on Sea in went the Alcon Dailies Total 1 Multifocal for me and bizzarely my son had ‘borrowed’ a pair of Johnson & Johnson Acuve Oasys 1 Day from me. This is where it gets complicated. He is a -2.25 ish and I’m, a -1.25 but his favourite swimming goggles ( Swans) have a -1.00 prescription lens in. I struggled on with my View goggles plano, hence the contact lenses. The lenses are scratched but they fit and with a sea swim beckoning you need a goggle you can trust. It was just 800m but the tide made it feel like double that and I was glad I didn’t have the second lap the Half Ironman distance racers had to endure. I’d been in the water for an incredible 22 mins certainly travelling further than the 800m course. As the water temperature was quite nippy I opted for Dibble optical’s Anti Fog treatment on the goggle, unconventional, but it works. My vision was unimpeded throughout the swim, just as well as the tide ras running high.The boy opted for a Norville Clarity wipe which, by all accounts, had the desired effect too. It jhas to be said both do smear the lenses somewhat, but prevent a full fog up and need to stop. The swim started at 8.00am as the tide turned and with a little advice from the marshals to get in close to the bank to avoid the strongest current we were off. Let’s just say it was tough swim. The goggles held up and I was delighted to see my son’s bike still in its rack as I ran the 200 yards from the River Blackwater into transition. Off with the wetsuit, swimhat and goggles and on with bike gear and the Adidas Evil Eye half rim pro. I was immediately reminded what a great cycling spec this is. I have an optical insert in this model but removed it to combine with the Dailies Total 1. Triathlon is about minimalism, and this was a shortish one, the Half Rim’s browbar means you don’t need a cap on the bike or the run. As I left transitions I noticed my son arriving, his goggles made way for an Oakley Jawbone and Transitions Signature V11 lenses. Maybe not the best choice on such a sunny day? The bike was enjoyable if full on. With just 45kms there was no time for hanging around and I sped through the countryside of the Dengie peninsula with both the contact lenses and the sunglasses doing their job. I had promised myself I wouldn't push too hard on the bike as it was cramp on the final run section of the tri that had made cost me a Did Not Finish at the Fambridge tri last year. But I couldn’t help myself and pushed a little too hard. I eventually finishing the bike leg in a couple of minutes under one and half hours. As I arrived at T2 to switch from the bike to the run I felt good but as soon as I started on the run my right hamstring started to cramp. I couldn’t believe I was going to suffer another DNF and get overtaken by my son. I stopped and stretched out then started jogging slowly and realised I could keep a tick over pace going without cramping. I also realised the runners in front of me weren’t speeding away making me realise I had just gone off too fast. By now the sun was beating down and the temperature was rising but the beautiful countryside and sea views made it all rather enjoyable. As I passed the 6th Century St Peter’s Chapel I came to terms with the inevitable overtake, but it didn’t come. My son had had his own dramas out on the road. I made it through the 10km off road course in, a rather tardy, one hour, making a total time of 2hrs 56mins and 34secs for the whole triathlon. The commentator gave a shout out or two for Optician and Blind Veterans UK and Vision Aid Overseas and made the point that 'Dad' had come home first. Around seven minutes later my son emerged, the Jawbones were gone, too heavy for the run, and, he was stripped to the waist to cool off (against triathlon rules) but happy. There are many considerations in triathlon but vision is certainly one element that can't be compromised.